Providing you the best range of natural rodent repellent with effective & timely delivery. 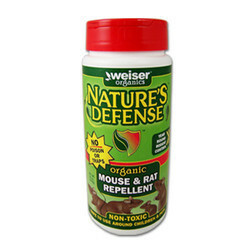 Natural Rodent Repellent effectively deters rats & mice from protected areas These 100% organic granules can be sprinkled anywhere to create an irritant scent barrier that keeps mice and rats away. Made from all-natural ingredients, it is even safe to use around children and pets! No more mess or clean up from using poison or traps Sprinkle granules near all cracks or openings along the outside foundation of your house, garage, shed or other buildings. Also apply around garage doors, main doors, basement windows, garbage cans, mulch piles, gardens, flowers beds or other problem areas. Allow 2 to 3 weeks for product to take full effect. Will not harm plants or grasses.